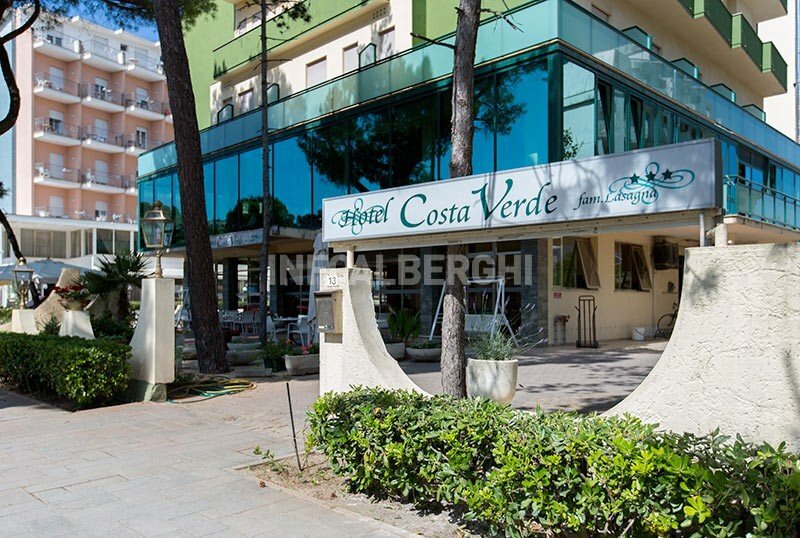 The Costa Verde Hotel in Milano Marittima, a few steps from the sea, offers all the comforts and services of a three-star hotel, including air conditioning, typical cuisine, WI-FI connection, agreements with parks and discos and much more. Pets Allowed. The hotel is in Milano Marittima, in the Anello del Pino area, a stone's throw from the sea and the beach, and near the pine grove that surrounds the whole area. The center of Milano Marittima can be reached in a few minutes. The hotel rooms are equipped with a balcony, pay air conditioning, telephone, safe, WI-FI connection, and a bathroom with shower and hairdryer. FAMILIES: both family and connecting rooms available. Garden, reading room, internet point, lift, gym, theme nights, evening entertainment by the pool. PARKING: free discovered, 26 places. WI-FI : available throughout the entire hotel. AIR CONDITIONING : in the common areas, in the dining room and in the rooms. AGREEMENTS : beach, amusement parks, discos, swimming pools, law enforcement, shuttle service. PETS : small ones allowed. LUNCH AND DINNER : 4 first courses and 4 second courses with fish always present, vegetable buffet and dessert. Water and wine included. CHANGES: the menu includes dishes for vegetarians. In the hotel: outdoor playground area, bottle warmer. At meals : table seats, baby menus. On the beach : playground area. The prices of the price list are per person per day in a double room for a stay min. of 5 days. TOURIST TAX: Not included. € 1.00 per person per day (April-May-September), € 1.50 per person per day (June-July-August) for a maximum of 7 consecutive nights, excluding children up to 14 years. ALL INCLUSIVE: Full board + Water and wine included with meals. A stay of min. 5 days full board includes Beach Service with a beach umbrella and two sun loungers. - Meals not consumed are not refundable.